There are many names that instantly come to mind when we think of the early days of Carnival Glass – but we can safely bet that none of our readers would immediately think of Reub Levy. Reuben Levy was born in Melbourne, Australia, in 1875, and as a young man, Levy was employed by a major wholesaler called Hoffnung & Co., based in Sydney. The firm dealt mainly in crockery and glass tableware, and young Reub must have had an excellent grounding in the business as well as picking up trade connections, as Hoffnung & Co. were major international traders. Reub had several brothers, one of whom (Bert) had emigrated to the USA and had become something of a star! Bert Levy was not only a well-known cartoonist for the New York Telegraph, he also became a Vaudeville star, creating caricatures on stage as part of a “quick draw” act. Another of the Levy brothers, however, decided to go into business with Reuben, and in 1910 they opened Levy Bros Ltd., on George Street, in downtown Sydney, trading mainly in (you guessed it) crockery and glass tableware. Perhaps the two Levy brothers found they didn’t get on well as business partners, because two years later, Reub decided to go it alone, and he re-invented himself as “The King of China” (that’s “china” as in crockery, of course). Self-styling himself as “The King” he even inferred that he was “elected” and he often told little stories in his advertising that surely entertained the readers. It must have been quite a sight! Reub Levy’s store on George Street was four floors high and had two large shop windows on the main street frontage. The walls were yellow, but the main visual draw had to be the massive dragon on the flat roof. The store was packed with glassware, crockery, “fancyware” and haberdashery, kitchenware and confectionery – offering the cheapest goods in town, piled high, aimed at rapid turnover and cash sales. Reub was undoubtedly an interesting character, and his promotional advertising tells quite a story. The headline below shows his creativity: the point was that it's the meat in a sausage that matters, and so it was with his store - it was the "Solid, Substantial Values" on offer in his store. "No HUMBUG-no tricks-no excuses- but a fair, square, straight deal"! George Street, Sydney, early 1900s. Courtesy The Powerhouse Museum. Levy’s previous experience (and international contacts) at Hoffnung & Co. served him well, as he was able to deal directly with USA factories … and Imperial in Bellaire, appears to have been his favoured choice. American-made Carnival Glass began to be featured in Levy’s ads from around 1918. ​In 1921 Levy hit the mother lode. A full page of Carnival Glass was on offer (all from Imperial), with the star piece (an Imperial Grape water set) being described as “The King” Water Set. Two Carnival colours were offered, described as Rubigold and Helios, with a further option of clear glass, which Levy described as “Imicut”. The ad is reproduced full size on a separate page. Click on the thumbnail on the right or Click Here to see it. ​Extracts from it are shown below. ​Above: "The King" Water Set in the 1921 ad - Imperial Grape in "Rubigold" (marigold). On the right, Imperial Hobstar Flower comport in Helios. ​Pictures courtesy of Seeck Auctions. 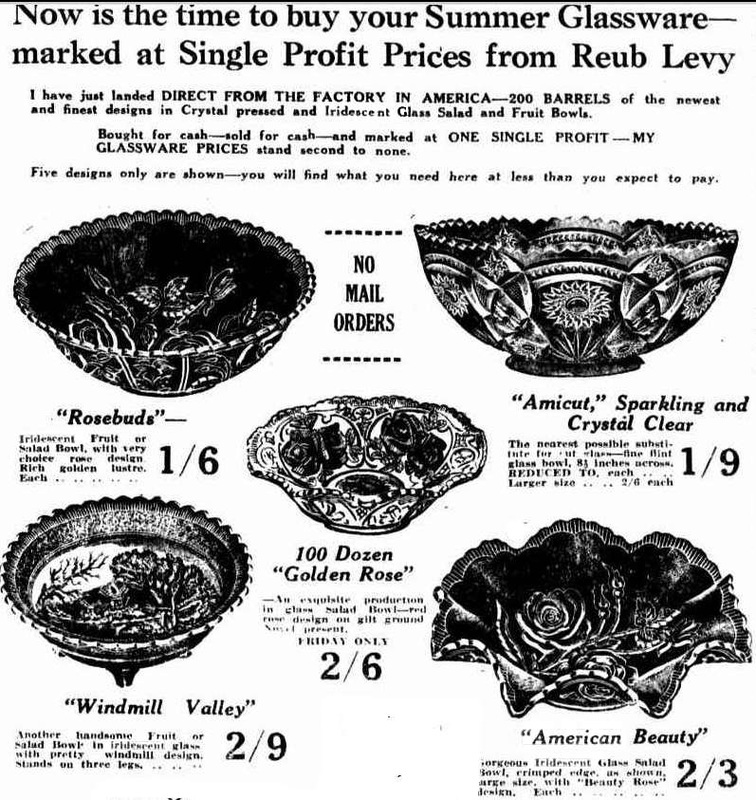 The patterns on offer included the Imperial Grape water set that Reub Levy named after himself (“The King” Water Set) shown above left. 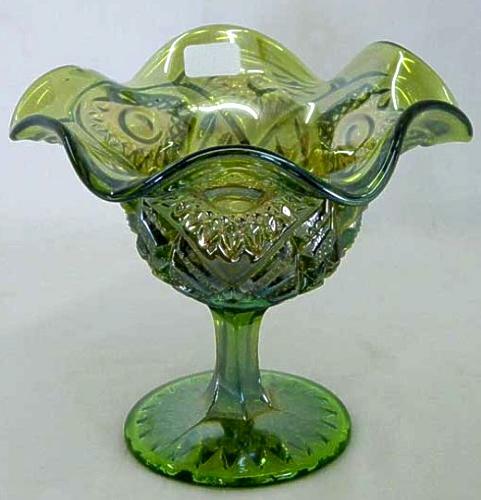 Other familiar patterns included Hobstar Flower comport, Diamond Lace (offered in both iridescent and clear / Imicut) and the “American Beauty” bowls which are Open Rose (ruffled /crimped and ice cream shaped, which was described as a salad bowl). Some of the other patterns (in Imicut) include Hexagon and Cane, Snow Fancy and Fashion. Above: an extract from Reub Levy's 1921 ad showing three bowls (left to right): Diamond Lace in "Imicut" (clear), Open Rose in Rubigold (marigold Carnival) and Fashion in "Imicut" (clear). Below: the same three patterns as seen in Carnival Glass - Diamond Lace (helios), Open Rose (marigold) and Fashion (smoke). Courtesy Seeck Auctions. The prices are interesting. Clearly they were presented as bargains in Australia, as Levy claimed to have the lowest prices; comparative figures show that a full iridescent water set in the USA was probably selling at around $1.50 in 1921. Levy’s price was 35 shillings (that’s three pounds and fifteen shillings) for an Imperial Grape water set - whilst probably cheap for Australia (with shipping from the USA added in), it was equivalent to four times the USA price! 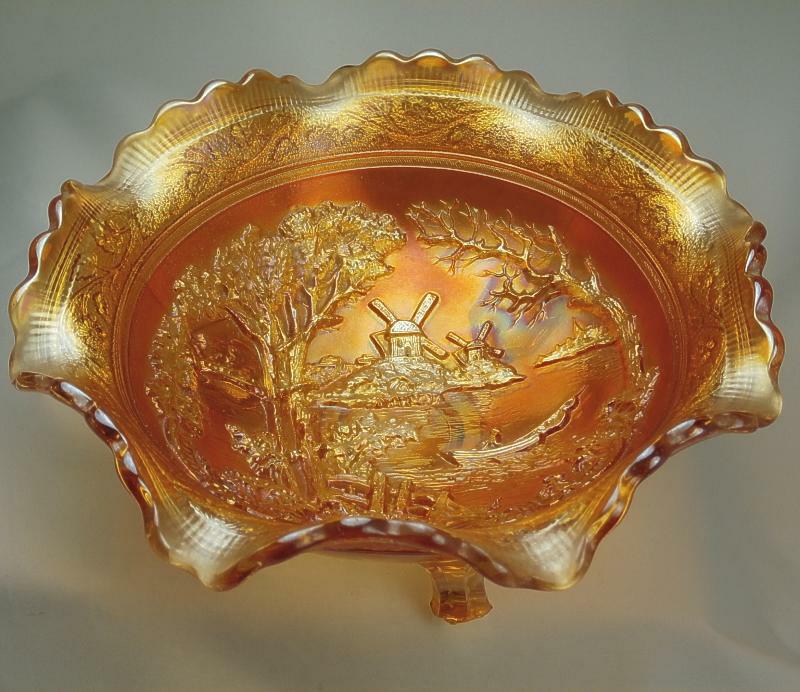 Another Sunkist piece featured by Levy was the marigold Double Dutch bowl. 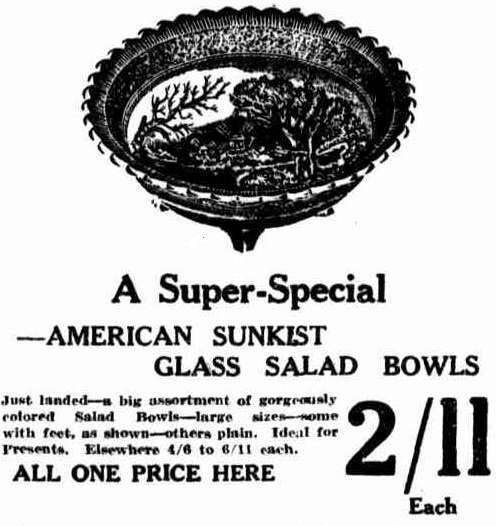 The ad in the Sydney Sun in October 1924 stated that the “American Sunkist glass salad bowls” had “just landed” amid a “big assortment of gorgeously colored Salad Bowls”. It’s interesting to note the drop in price too, as another Levy ad two years later for the same bowls was cheaper. Another interesting observation is that the illustrations of the pattern in Levy's ad. appear to be a "mirror image" - the bare branch is on the left of the image, but is on the right of the actual item. There’s no doubt the Levy ads had a way with words. Initially describing marigold Carnival as the rather evocative “Sunkist” in 1918, they invented a new term for it in 1926 - Cloth ‘o’ Gold. The Carnival pictured was a Lustre Rose water set, promoted as “an ideal wedding present” and being sold at 12/6d (twelve shillings and sixpence) which Levy said was sold “everywhere” at 16/6d. A bargain, especially considering that this was half the price of the Imperial Grape water set that Levy had been selling five years earlier. 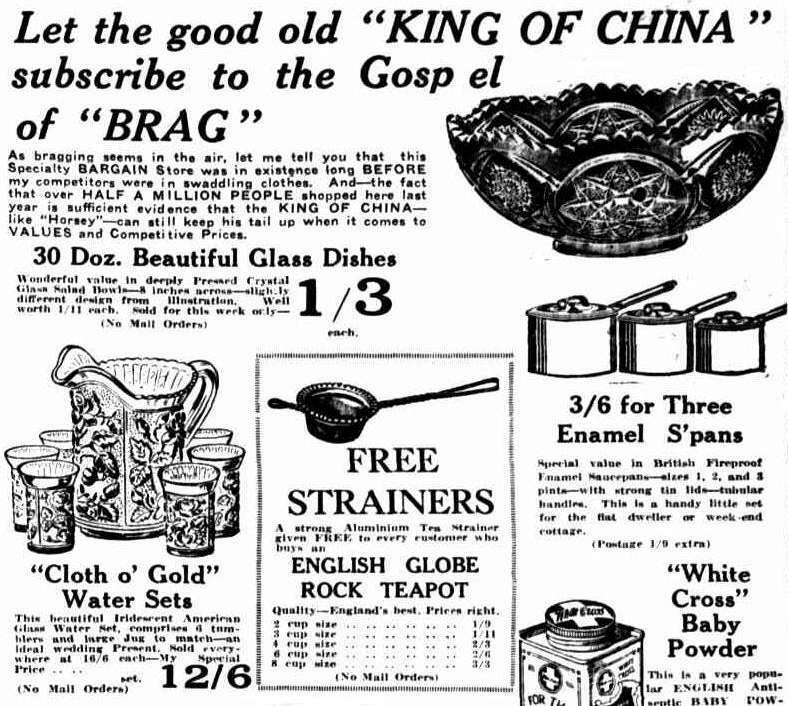 ​We feature an enlarged extract of this ad on the right to show you the promotional “hype” that Levy wrote, deliciously describing himself as the “good old KING OF CHINA” who subscribed to the “Gospel of BRAG”. Note the geometric design of the dish at the top of the ad … looks to be Imperial’s Snow Fancy in clear glass. What is interesting is the date of this promotional ad. It was published several months after Levy’s death. Judging by the style, it was probably written by him before his demise, and published afterwards as the store continued for several years after his death. Lustre Rose water set, marigold. Sydney Sun 1926 - buy a "Cloth 'o' Gold" (Lustre Rose) water set! 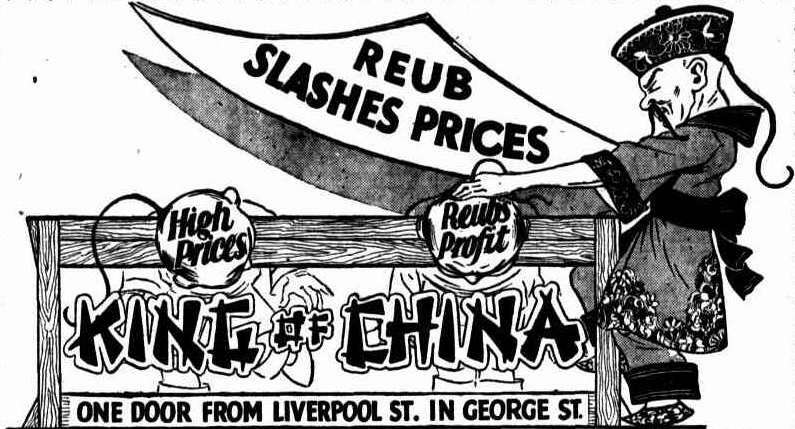 Despite Levy’s sudden and very unexpected death in 1925 at the age of fifty, the “King of China’s” store carried on, even bringing in fresh supplies from the USA, which Reub had probably set up before his untimely death. Note also that a piece of what appears to be Goofus glass is also included in the selection. ​Below: without Reub at the helm the store began to suffer and in 1928 prices were slashed. 1928, and prices are slashed! ​The end of the King of China’s empire was in sight. A few months later a notice in the papers declared that there were just five days to clear the stock due to termination of the lease. Clearance sale, cash and carry away only! ​​In the decade and a half that “The King of China’s” store had been trading, they were surely responsible for a massive amount of Carnival Glass being brought into Australia. the King of China’s reign was over. ​In The King of China Part Two we take a look at some more Carnival Glass items that Reub Levy sold – they are from Europe plus a surprise piece from Crown Crystal in Australia. Don’t miss it!